• Corporate-Business Customers. Providing a range of services including one-time charter bus rentals for your company Holiday party or trip outings; ongoing service for your hotel shuttle bus needs; or regular transport for employees among office buildings. We can also coordinate transportation solutions for conventions and trade shows. • Industrial or Agricultural Customers – We can provide buses to transport regular or seasonal employees to and from work daily or shuttle employees across your industrial sites. • Institutional Customers – For hospital networks, university campuses, or government institutions. If you have sprawling grounds or need connectivity among/within campuses or locations, we can provide shuttle and route planning services that are turn-key. Our buses provide a fully outsourced, cost effective and safe solution for transporting your customers or employees where and when you require. With several hundred buses available, we have the right vehicle type for you. Whether you require a one-time, budget friendly school bus rental or need executive coach style buses with audio/video and air conditioning – call us first. 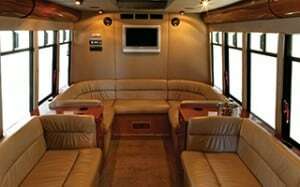 See photos of our upscale executive coach and school bus options here! • Low Cost, Superior Quality. We more than “rent buses” to industrial, commercial and institutional customers. We provide full service, turn key transportation. This includes professional licenced drivers and buses maintained by certified technicians. It also means buses running in constant contact with our dispatch team and overseen by our experienced local managers. • Passenger Load Flexibility. Our services are scalable to accommodate situations where your passenger load counts, and thus vehicle requirements, change. Costs are tied to actual service usage. Typically, in-house fleets often can’t support this. • Safety & Trust. We’re trusted by business and industry to transport adult passengers in addition to our commitment to district school boards as we transport thousands of kids daily. • Insured – We’re fully insured to provide you peace of mind. Let us take care of the bus operation details so you can focus on business. • Ready Human Resource Pool – We employ a team of hundreds of drivers, technicians, management and support staff solely focused on delivering superior transportation services. Never worry about an employee illness or management concerns that might disrupt services when you outsource to us. Contact us for a FREE QUOTE or consultation to discuss your transportation needs! Serving Commercial & Institutional Clients in Your Area! Our busing services are available throughout most of Southern Ontario, including; Greater Toronto, Mississauga, Brampton, Etobicoke, Markham, North York, Oakville, Burlington, Windsor-Essex County and Bradford-Simcoe County. To learn more about transportation solutions for your organization, submit the online charter request form or contact us today!